Family Camp was our first time at Camp Fircom and it was a great experience, full of activities. The hosts and all the workers were fabulous at tending to all of our needs including the fabulous food. I would definitely recommend for any family to go and have a memorable time." For your next family vacation, skip the lengthy travel times, over-priced restaurants and expensive add-ons. 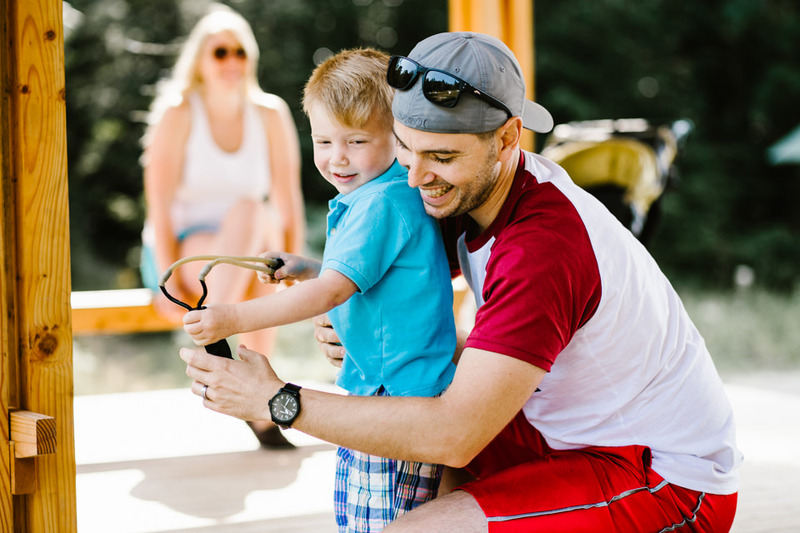 Vacationing at camp keeps cash in your pocket, you out of the kitchen and your family unplugged! Cottage Add-On $100 | Craigcroft Add-on $50 | added to Adult participants only. Family Camp is a gentle blend of structure and choice, giving you a chance to play, relax, discover, learn and share with other families. After arriving and settling into your accommodation Friday afternoon you’ll have time to get to know your fellow families and before we open the weekend with a delicious dinner. The evening will include games, campfire and snack. Late night programs offer families options to unwind as they choose. Saturday morning you can participate in morning reflection and/or take a dip in the ocean before enjoying a sumptuous breakfast. The morning and afternoon program session will feature a variety of options suitable for a wide age-range, including kayaking, archery, farm exploration, and exciting arts options. Younger children will need to be accompanied by their parents to their age-appropriate program options; however, older kids and parents can choose to participate on their own, or with their family, in other sessions. If you want to have some free time to nap or hang-out as a family, you can do that too as none of the sessions are mandatory. Saturday night will have a themed dress-up dinner for a chance to win prizes! Afterwards, enjoy a camp-wide game that gets families running around in search of victory. End the day with a snack at the creative café where you and your children can perform your favourite songs, and enjoy being goofy together. Optional late night programming will be offered for parents who want to enjoy a campfire. On Sunday, take in another morning ocean dip or attend the optional morning reflective practice. Before packing up and eating lunch, get in a last round of activities to load up on family memories to last you until next summer! We were absolutely impressed with the phenomenal food and hope Fircom will continue to attract first-class chefs. We loved the beautiful amenity buildings, the canoeing and swimming, and the games on your big lawn. We also enjoyed archery. There was a lovely female staff member who made a point of playing with the kids down by the water -- she took my son and one other girl to the edge of the rocks and held their hands as the waves came crashing up to them -- wonderful! There are several accommodation options for the weekend. Some options require add-on registration fees. Accommodation is reserved on a first-come, first-served basis. This is a luxury accommodation with six bedrooms and three bathrooms. Sleeps 12 max. Additional fee of $100 per adult. Includes linens (not towels) and real mattresses. Offers more privacy. Each room sleeps two people so families of 2+ will be spread out. Cottage is situated farthest from the centre of camp so it might impact sense of involvement. Craigcroft is a two story dormitory style building. Each room has a bunk bed and a single bed. Additional fee of $50 per adult. Craigcroft has two bathrooms - one on each floor. The rooms in Craigcroft give you a little extra privacy. Craigcroft can be loud when full and also hot in the summer. You will end up using the communal bathrooms as two bathrooms is not enough for everyone. There are six cabins at Fircom. Each one has eight bunk beds. Cabins 1 through 4 have a small side room that is curtained off for extra privacy. Cabins are the true camp experience! They are quite spacious with only 3 or 4 families. This option is the best if you are coming with friends and would like to share! There are no washrooms in the cabins, however it is a short walk to the washrooms in Jubilee Hall. The cabin is shared accommodation with an open floor plan. There is not as much privacy. There are four Sibley tents. They are canvas tents with mattresses on the floor. Each Sibley tent houses one family. The closest washrooms are a short walk away in the Dining Hall. The Sibley tents offer more privacy than the Cabins and are great for a larger family looking for a more rustic experience. The Sibley tents are more open-air than any other accommodation. This means that there can be bugs.